Alaska Brief September 2018: Who can protect salmon in Alaska? Voters. We don’t need Twitter to tell us that the Trump administration couldn’t care less about where or how Alaskans–or any Americans–live in 20, 30, or 40 years. The administration’s roll back of rules protecting our air and climate, water, food, jobs, free expression, and communities says it all. Why slash rules that save and improve American lives? Follow the money. That’s been thrown overboard like unwanted bycatch. Every gubernatorial candidate except one opposes Ballot Measure 1, the Stand for Salmon initiative. Our elected officials in Alaska, along with administrative agency decision makers, teeter on the political tightrope rather than take a real stand for a sustainable future. Witness the partner legislation to the Stand for Salmon initiative, HB 199. This legislation has gained no traction with our state legislature, despite it protecting a renewable resource industry-salmon fisheries. Trustees’ lawyers successfully defended Ballot Measure 1 in court precisely because we work toward a sustainable future every day. Ballot Measure 1 represents our vision of a wild and vibrant Alaska where fish, wildlife and people thrive. It represents social and cultural economies that give Alaskans self-sufficiency and resilience. It represents the foundation for ongoing access to food, jobs, recreation, culture, and meaningful connection to communities. Ballot Measure 1 would protect salmon habitat by setting up a permitting system where Alaskans have a say in how we protect a resource that nourishes us. Projects that would do the most harm to habitat supporting salmon would get more scrutiny. Projects that damage fish habitat would be on the hook for fixing it. The measure would also protect all Alaska waters. Projects that claim there are no fish to protect would need to demonstrate there are no fish to protect–the financial burden would be on the permit applicant, not public funds. These reasonable expectations appear to make elected leaders nervous and industry ready to fight. 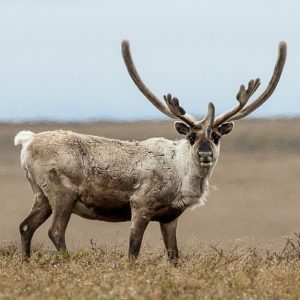 Corporations from the mining, and oil and gas industries have poured millions of dollars–nearly $10 million and counting–into a fearmongering campaign stating that Ballot Measure 1 will shut down Alaska’s economy. That is simply not true. The Alaska Supreme Court removed two provisions of the proposed law that it found could not be enacted by initiative. The remaining regulatory requirements simply set up a consistent decision making process that ensures renewable salmon resources. Ballot Measure 1 is in fact pro-jobs, pro-food, pro-Alaska fisheries. What precisely do the extractive industries object to, then? Alaskans having a say in what happens in their communities? Expectations that our agencies hold industries accountable for preventing and fixing damage done to salmon habitat whenever possible? Voters embracing sustainable economies that connect them to each other and give them the power to create a vision for their communities? The very idea of Alaskans gaining more voice, more agency, more say over their health and future? We don’t need Twitter or industry mega-million-dollar campaigns to see what’s going on here. Alaskans can reclaim their vision for Alaska this November, and these Outside corporations know it. 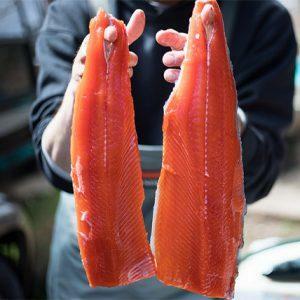 Vote Yes on Ballot Measure 1–keep Alaska and your freezer full of salmon for the long term. 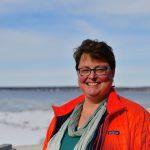 Alaskans can vote for salmon on Nov. 6. Find out about Ballot Measure 1 and voting deadlines here–then pass it on! The Trump administration wants to sell off Alaska’s Arctic to private industry to prop up its “energy dominance” propaganda. Thankfully, there are laws to protect public lands, not enable the hasty lining of pockets-and that’s why we took the Trump administration to court earlier this year. 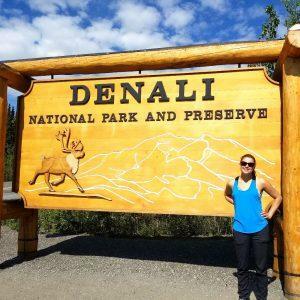 Intern Jenna Lewis learned a few things while with Trustees: I am now more certain than ever that I want to pursue a career in this field and advocate for a cleaner, healthier, and better-protected environment. 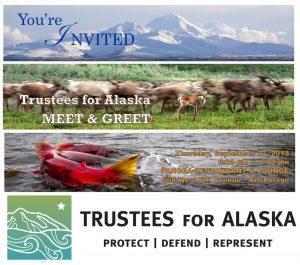 Come meet some of our board members and staff between 5:30 to 8:30 p.m. Thursday, Sept. 27, at Pangea Restaurant in Anchorage. We’ll provide food and drinks, and share your enthusiasm for protecting Alaska.